[Octon, France]: Verdigris, 2008. Limited Edition. Hardcover. Fine. Rothchild, Judith. 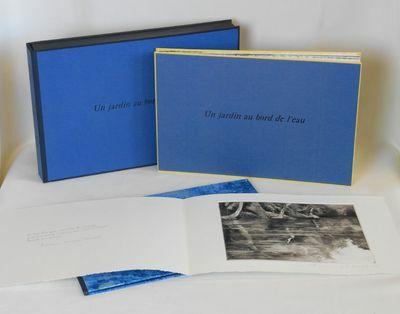 Number 6 of 10 de luxe editions (total edition 50), oblong octavo size,  pp., signed by the artist and author, text in French. Frederic Jacques Temple (b. 1921), French poet and author, decided to pursue writing as a career following a meeting with Blaise Cendrars in 1949. This work by him is a collection of memories of the Aveyron River and surrounding area from childhood; his early memories influenced much of his work, including "L'Enclos" which celebrated the "mythical" city of Montpelier where he attended the college of the Enclos Saint-Francois. The accompanying intaglio prints by Judith Rothchild are a combination of mezzotint and dry point techniques for which she is well known, with the type enjambed to lengthen the ripples of the riverbanks which extend borderless across double-page spreads; thus each page flows seamlessly into the next like the bends of a river. The words like the ripples and river stones are given an added dimension of meaning, especially being fragments of a long-distant childhood. The lush woodlands, and light filled waters of southern France are praised in this romantic accolade by two of its natives.___DESCRIPTION: Original binding of blue paste paper over yellow paper affixed to both boards and the title letterpress printed to the upper board, concertina or "leporello" style, text in French, 11 gravure mezzotints, handset in Vendome Romain and printed on an Albion Press, Hahnemuhle paper, oblong octavo size (11.75" by 7.75"),  pp., limited edition, this number 6 of 10 de luxe copies, from a total edition of 50, signed by the author and artist. Accompanied by one additional print signed and numbered by the artist with a handwritten poem by the author, also signed, and housed in a blue marbled paste paper portfolio; both items are housed in a matching fall-down-back box with marbled black and blue pastepaper guards.___CONDITION: Fine; crisp, clean, as new and free of prior owner markings; in a like case. A lovely collaboration between artists.___POSTAGE: International customers, please note that additional postage may apply as the standard does not always cover costs; please inquire for details.___Swan's Fine Books is pleased to be a member of the ABAA, ILAB and IOBA and we stand behind every book we sell. Please contact us with any questions you may have, we are here to help.